I've had this book on my bookshelf for about a year now and consider it my 'go to text' for any student who is having a bit of a hard time with their confidence, or seems to be experiencing some emotional trouble of varying intensities. I consider it a valuable text because it not only helps to identify potential emotional problems, it provides checklists to consult and also recommends the next steps should you need further support. 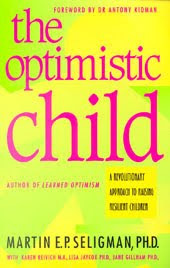 "In The Optimistic Child, Dr. Martin Seligman offers parents, teachers, and coaches a well-validated program to prevent depression in children. In a thirty-year study, Seligman and his colleagues discovered the link between pessimism -- dwelling on the most catastrophic cause of any setback -- and depression. Seligman shows adults how to teach children the skills of optimism that can help them combat depression, achieve more on the playing field and at school, and improve their physical health." The author, Martin Seligman is considered the 'father' of the positive psychology movement which provides the foundation for many emotional well-being programs in schools. A welcome relief from the 'self-esteem' generation I grew up with in the 1980s! Please just pop me an email if you'd like to borrow the book for a read in your own time or, you can purchase the text here.